A bone conduction implant (BCI) uniquely combines the concepts of osseointegration and bone conduction hearing. Several bone conduction systems are now available. The first BCI system developed was Baha. Baha uses a percutaneous osseointegrated fixture to create a method for direct transmission of vibration to the skull using a bone conduction hearing device. Baha was introduced by Tjellstrom et al, who established the first 3 patients in 1977. 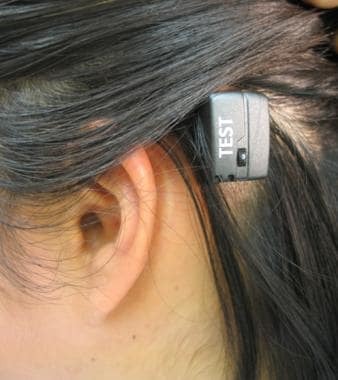 The US Food and Drug Administration (FDA) approved use of the Baha for conductive and mixed hearing loss in 1996 and for single-sided deafness in 2002. More recently, BCI systems that use implanted osseointegrated magnets and the first BCI system using an implanted bone conduction transducer have been developed. An image depicting bone-anchored hearing systems can be seen below. Bone-anchored hearing systems. Position of processor following surgery. The concept of osseointegration was discovered and developed in Gothenburg, Sweden, by Professor P.I. Branemark, who recognized the potential for growth of bone tissue in contact with the surface of a titanium implant. Branemark defined osseointegration as a direct structural and functional connection between ordered living bone and the surface of a load-carrying implant. Most materials fail to osseointegrate, and, instead, a foreign body reaction leads to formation of a fibrous capsule around the material. Titanium has proven to be the material of choice for osseointegration; the use of titanium implants in the field of dental implantation, first introduced in 1965, has exploded worldwide. Osseointegration is reliably achieved in the Baha system using commercially pure titanium (99.75 %), which is machined, then covered with an extremely biocompatible thin oxide layer. Osseointegration is dynamic process that develops gradually over 6-12 weeks following fixture implantation. Many factors influence successful osseointegration, including the material, the macrostructure and microstructure of the implant, the quality of bone at the site of implantation, and surgical factors. The implant must remain completely immobile during the initial period of osseointegration. This is critical; otherwise, osseointegration fails, with the formation of a fibrous capsule around the implant instead of new bone formation. The initial stability of the implant is mechanically achieved via the use of a screw-shape implant that is secured to bone with precise torque parameters. Bone conduction hearing is unique in that it can produce clear sound perception regardless of outer and middle ear function, as long as inner ear function (cochlea) is intact. Several factors contribute to bone conduction hearing, including the sound pressure within the external ear canal, the middle ear and middle ear ossicle motion, and cochlear fluid movement. The ear canal and walls of the middle ear contribute to bone conduction hearing via skull vibration, which produces radiated sound in the ear canal and middle ear. However, this effect is small because sound pressure found in the open external auditory canal is 10 dB less than bone conduction threshold levels. During skull vibration, inertia of the middle ear ossicles produces motion of ossicles relative to the skull vibration. This effect contributes primarily to the low-frequency and mid-frequency bone conduction hearing. The inertial effects of cochlear fluid relative to vibrating bone is the most important contributor to bone conduction hearing, and this effect produces basilar membrane motion that is the same as air-conduction hearing. A bone conduction implant (BCI) is used to treat 2 basic problems: conductive and/or mixed hearing loss and deafness in one ear (single-sided deafness). These devices are considered when use of a conventional (air-conduction hearing aid) is not possible. For the case of conductive or mixed hearing loss, they are used most commonly in patients with chronic ear infections, cholesteatoma, and chronic otorrhea in which the diseased eardrum and/or middle ear ossicles are not able to conduct sound to the cochlea and use of a conventional hearing device often is not possible. The other common situation is congenital aural atresia in which absence of the ear canal and eardrum causes conductive hearing loss and a conventional hearing aid cannot be used. Bone-anchored hearing systems. Conventional bone-conducting hearing aid. Baha has been used in both adults and children for more than 30 years. [8, 9, 10] According to the manufacturer’s information, more than 45,000 patients worldwide are fitted with Baha today. Vestibular schwannoma accounts for 1 in 100,000 cases. Ménière disease causing profound hearing loss accounts for 10 in 100,000 cases. Sudden sensorineural hearing loss resulting in profound hearing loss accounts for 12 in 100,000 cases. This type has the same etiologies described for conductive hearing loss, but this condition generally involves older patients in whom some degree of sensorineural hearing is present as well. Conductive hearing loss results from abnormalities of the external ear canal, tympanic membrane, middle ear, or ossicle that reduce the effective intensity of the air-conducted signal reaching the cochlea. Examples of abnormalities include occlusion of the external auditory canal by cerumen, infection, a mass, or atresia; middle ear infection and/or fluid; perforation of the tympanic membrane; or ossicular abnormalities. By definition, the threshold for conductive hearing loss is pure-tone air-conduction thresholds poorer than bone conduction thresholds by more than 10 dB. The maximum threshold in conductive hearing loss is 60 dB. Bone conduction is far less effective than air conduction for amplifying sound in patients with purely sensorineural hearing loss. However, in patients with sensorineural hearing loss and conductive hearing loss (mixed hearing loss), air-conduction hearing aids lose effectiveness because in contrast with a Baha, an air-conduction hearing aid has to compensate for the conductive hearing loss. This requires larger amounts of sound energy, pushing the limits of amplification and output levels of an air-conduction hearing aid (owing to increased susceptibility to feedback and saturation of the amplifier). Accordingly, as the width of the air-bone gap increases, patients’ performance with the air-conduction hearing aid gradually approaches that with the Baha. At a certain point, a break-even point occurs at an air-bone gap of 25-30 dB. Thus, in a patient with mixed hearing loss in whom the air-bone gap exceeds 30 dB, the Baha system has the potential for better performance than an air-conduction device. Current therapeutic strategies for treating single-sided deafness are based on the use of specialized hearing instruments, as such frequency-modulated (FM) systems, or semi-implantable devices. The common purpose of all these devices is to reconstruct some amount of binaural hearing with one ear, ie, by providing the healthy ear with acoustical information transferred from the deaf side. The first systems based on this general idea were labeled contralateral routing of offside signal hearing aids or contralateral routing of signals (CROS). In these systems, a microphone placed on the deaf side transfers acoustical information by wired electrical transduction to a receiver placed on the contralateral ear. Current CROS systems are still based on the same theoretical approach but use wireless technologies, such as FM transduction, that significantly improve wearing comfort and aesthetics by eliminating visible wires connecting the 2 required hearing devices. An alternative approach to transferring the signal electrically from one ear to the other is use of transcranial bone conduction , a principle sometimes also referred to as transcranial-CROS. This strategy is based on fitting the deaf ear with a highly powerful hearing instrument. The output of the hearing aid increases to such a level (100-120 dB sound pressure level) that the resulting intense vibrations of the receiver may be conveyed via bone conduction, along the cranial bone and ultimately encoded by the contralateral cochlea. Therefore, in contrast to the standard CROS system approach based on electrical transmission of sound and final air-conduction hearing, transcranial-CROS systems use bone conduction for the ear-to-ear transmission. Although both have proven efficient in some cases, patients often reject these systems for cosmetic (presence of wires or large and visible behind-the-ear housings), acoustic (noise caused by transcranial-CROS, absence of powerful-enough devices or efficient enough digital feedback cancellers), or efficiency reasons; the benefits provided by either system often remaining limited. Bone conduction devices effectively provide transcranial transmission of sound via bone conduction, thereby overcoming the limitations of conventional CROS aids and transcranial CROS. The chief benefit in single-sided deafness is providing the ability to hear speech spoken into the deaf ear by elimination of the head-shadow effect (speech sounds arising from the deaf side are blocked from reaching the hearing ear by the head). In addition, transcranial stimulation improves speech intelligibility in noise. This effect is most pronounced when noise is presenting to the hearing ear and the speech signal of interest is directed toward the deaf ear. Because normal sound localization requires two hearing ears, the transcranial stimulation in single-sided deafness is not expected to provide normal sound localization. The percutaneous abutment (passing through the scalp) is attached to the fixture either from the start (1 stage) or secondarily (2 stage). The abutment length is variable from 6-12 mm. Choice of abutment length depends on the type of surgical technique used and clinical characteristics of the patient. There is a strong trend toward using surgical techniques that preserve the subcutaneous tissue around the abutment. Instead of thinning the scalp tissue to accommodate a fixed length abutment, the abutment can be sized to the thickness of the scalp. 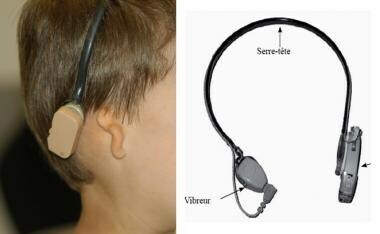 Several models of sound processors are available, and their use depends on the patient’s average bone conduction thresholds (ie, the patient's current sensory hearing ability). The Baha BP400 (Cochlear Ltd) sound processor uses digital processing of the acoustic signal and includes a directional microphone, adaptive signal processing, and integrated wireless technology. It is effective up to 45-dB average bone conduction threshold. The Baha BP310 (Cochlear Ltd) adds 10 dB more power output than the Baha BP400 and is effective up to 55-dB average bone conduction threshold. The Baha Cordelle II (Cochlear Ltd) is a body-worn unit with 13 dB more output than the BP400 and is effective up to 60 dB average bone conduction threshold. The Ponto Pro Plus (Oticon Medical) sound processor has a new, more efficient transducer, is digital and programmable, and includes automatic adaptive directionality and new feedback and noise management strategies. It also has new wireless capabilities and is available in regular and power versions. The Ponto Pro Power (Oticon Medical) can handle conductive and mixed hearing loss up to 55-dB average bone conduction thresholds. It is also effective for patients with single-sided deafness with sensory hearing in the hearing ear better than 20-dB average bone conduction thresholds. The magnet systems are still potentially susceptible to skin complications if the strength of the magnets used is overly strong. Baha is indicated for patients presenting an average hearing impairment in bone conduction better than or equal to 45 dB hearing loss (on the 0.5, 1, 2, 3 kHz) for BP300 or Pronto Pro sound processors, 55 dB hearing loss for the BP310 and the Ponto Pro Power, and 60 dB hearing loss for the Cordelle sound processor. The hearing ear should have 20-dB air conduction. The Baha is for patients who cannot or will not use conventional hearing aids or a contralateral routing of signals (CROS) hearing aids. The audiometric contraindications are relative in most cases. To guarantee good functional results, for conductive and mixed hearing loss, the average loss in bone conduction must be lower or equal to 45 dB for the Baha BP400 or Pronto Pro Plus, to 55 dB for the BP310 and Ponto Pro Power, and to 60 dB for the body-worn Baha (Cordelle). The minimum age of establishment must be taken into account. In very young children, the thinness of the temporal bone can be the cause of higher failure rates and 2-stage surgery should be used. When cranial bone is found to be less than 4 mm, an implant that is longer (ie, a 4-mm implant) than the bone thickness (ie, 2-3 mm) can be used with the implant screwed in as far as the dura. This leaves a portion of the implant protruding (ie, "proud") from the cranial bone surface that should then be covered with periosteum. During the staging interval, new bone growth osseointegrates the entire fixture. Tjellstrom A, Hakansson B. The bone-anchored hearing aid. Design principles, indications, and long-term clinical results. Otolaryngol Clin North Am. 1995 Feb. 28(1):53-72. [Medline]. Tjellström A, Rosenhall U, Lindström J, Hallén O, Albrektsson T, Brånemark PI. Five-year experience with skin-penetrating bone-anchored implants in the temporal bone. Acta Otolaryngol. 1983 May-Jun. 95(5-6):568-75. [Medline]. Branemark R, Branemark PI, Rydevik B, Myers RR. Osseointegration in skeletal reconstruction and rehabilitation: a review. J Rehabil Res Dev. 2001 Mar-Apr. 38(2):175-81. [Medline]. Albrektsson T, Branemark PI, Hansson HA, Lindstrom J. Osseointegrated titanium implants. Requirements for ensuring a long-lasting, direct bone-to-implant anchorage in man. Acta Orthop Scand. 1981. 52(2):155-70. [Medline]. Stenfelt S, Goode RL. Transmission properties of bone conducted sound: measurements in cadaver heads. J Acoust Soc Am. 2005 Oct. 118(4):2373-91. [Medline]. Nolan M, Lyon DJ. Transcranial attenuation in bone conduction audiometry. J Laryngol Otol. 1981 Jun. 95(6):597-608. [Medline]. Snik AF, Mylanus EA, Cremers CW. The bone-anchored hearing aid: a solution for previously unresolved otologic problems. Otolaryngol Clin North Am. 2001 Apr. 34(2):365-72. [Medline]. Hakansson B, Tjellström A, Rosenhall U, Carlsson P. The bone-anchored hearing aid. Principal design and a psychoacoustical evaluation. Acta Otolaryngol. 1985 Sep-Oct. 100(3-4):229-39. [Medline]. Lustig LR, Arts HA, Brackmann DE, et al. Hearing rehabilitation using the BAHA bone-anchored hearing aid: results in 40 patients. Otol Neurotol. 2001 May. 22(3):328-34. [Medline]. Mylanus EA, Snik AF, Cremers CW. Patients' opinions of bone-anchored vs conventional hearing aids. Arch Otolaryngol Head Neck Surg. 1995 Apr. 121(4):421-5. [Medline]. Declau F, Cremers C, Van de Heyning P. Diagnosis and management strategies in congenital atresia of the external auditory canal. Study Group on Otological Malformations and Hearing Impairment. Br J Audiol. 1999 Oct. 33(5):313-27. [Medline]. Mylanus EA, van der Pouw KC, Snik AF, Cremers CW. Intraindividual comparison of the bone-anchored hearing aid and air-conduction hearing aids. Arch Otolaryngol Head Neck Surg. 1998 Mar. 124(3):271-6. [Medline]. Vaneecloo FM, Ruzza I, Hanson JN, et al. [The monaural pseudo-stereophonic hearing aid (BAHA) in unilateral total deafness: a study of 29 patients]. Rev Laryngol Otol Rhinol (Bord). 2001. 122(5):343-50. [Medline]. Hol MK, Bosman AJ, Snik AF, Mylanus EA, Cremers CW. Bone-anchored hearing aids in unilateral inner ear deafness: an evaluation of audiometric and patient outcome measurements. Otol Neurotol. 2005 Sep. 26(5):999-1006. [Medline]. Lin LM, Bowditch S, Anderson MJ, May B, Cox KM, Niparko JK. Amplification in the rehabilitation of unilateral deafness: speech in noise and directional hearing effects with bone-anchored hearing and contralateral routing of signal amplification. Otol Neurotol. 2006 Feb. 27(2):172-82. [Medline]. Tringali S, Marzin A, Dubreuil C, Ferber-Viart C. Bone-anchored hearing aid in unilateral inner ear deafness: electrophysiological results in patients following vestibular schwannoma removal. Acta Otolaryngol. 2008 Nov. 128(11):1203-10. [Medline]. Kruyt IJ, Nelissen RC, Mylanus EAM, Hol MKS. Three-year Outcomes of a Randomized Controlled Trial Comparing a 4.5-mm-Wide to a 3.75-mm-Wide Titanium Implant for Bone Conduction Hearing. Otol Neurotol. 2018 Jun. 39 (5):609-15. [Medline]. Wise SR, LaRouere JS, Bojrab DI, LaRouere MJ. Comparison Study of Percutaneous Osseointegrated Bone Conduction Device Complications When Using the 9 mm Abutment Versus 6 mm Abutment at Initial Implantation. Otol Neurotol. 2018 Apr. 39 (4):451-7. [Medline]. Giannantonio S, Scorpecci A, Pacifico C, Marsella P. A functional and anatomical comparison between two passive transcutaneous bone conduction implants in children. Int J Pediatr Otorhinolaryngol. 2018 May. 108:202-7. [Medline]. Carnevale C, Til-Perez G, Arancibia-Tagle DJ, Tomas-Barberan MD, Sarria-Echegaray PL. Hearing outcomes of the active bone conduction system Bonebridge® in conductive or mixed hearing loss. Acta Otorrinolaringol Esp. 2018 May 18. [Medline]. Kulasegarah J, Burgess H, Neeff M, Brown CRS. Comparing audiological outcomes between the Bonebridge and bone conduction hearing aid on a hard test band: Our experience in children with atresia and microtia. Int J Pediatr Otorhinolaryngol. 2018 Apr. 107:176-82. [Medline]. Sprinzl GM, Wolf-Magele A. The Bonebridge Bone Conduction Hearing Implant: Indication criteria, surgery and a systematic review of the literature. Clin Otolaryngol. 2015 Jun 13. [Medline]. Riss D, Arnoldner C, Baumgartner WD, et al. Indication criteria and outcomes with the Bonebridge transcutaneous bone-conduction implant. Laryngoscope. 2014 Dec. 124 (12):2802-6. [Medline]. Rader T, Stover T, Lenarz T, et al. Retrospective Analysis of Hearing-Impaired Adult Patients Treated With an Active Transcutaneous Bone Conduction Implant. Otol Neurotol. 2018 May 24. [Medline]. Macnamara M, Phillips D, Proops DW. The bone anchored hearing aid (BAHA) in chronic suppurative otitis media (CSOM). J Laryngol Otol Suppl. 1996. 21:38-40. [Medline]. Snik AF, Mylanus EA, Proops DW, et al. Consensus statements on the BAHA system: where do we stand at present?. Ann Otol Rhinol Laryngol Suppl. 2005 Dec. 195:2-12. [Medline]. McDermott AL, Dutt SN, Reid AP, Proops DW. An intra-individual comparison of the previous conventional hearing aid with the bone-anchored hearing aid: The Nijmegen group questionnaire. J Laryngol Otol Suppl. 2002 Jun. 15-9. [Medline]. Sheehan PZ, Hans PS. UK and Ireland experience of bone anchored hearing aids (BAHA) in individuals with Down syndrome. Int J Pediatr Otorhinolaryngol. 2006 Jun. 70(6):981-6. [Medline]. Kunst SJ, Hol MK, Snik AF, Mylanus EA, Cremers CW. Rehabilitation of patients with conductive hearing loss and moderate mental retardation by means of a bone-anchored hearing aid. Otol Neurotol. 2006 Aug. 27(5):653-8. [Medline]. Tringali S, Grayeli AB, Bouccara D, et al. A survey of satisfaction and use among patients fitted with a BAHA. Eur Arch Otorhinolaryngol. 2008 Dec. 265(12):1461-4. [Medline]. Priwin C, Granström G. The bone-anchored hearing aid in children: a surgical and questionnaire follow-up study. Otolaryngol Head Neck Surg. 2005 Apr. 132(4):559-65. [Medline]. Reyes RA, Tjellstrom A, Granstrom G. Evaluation of implant losses and skin reactions around extraoral bone-anchored implants: A 0- to 8-year follow-up. Otolaryngol Head Neck Surg. 2000 Feb. 122(2):272-6. [Medline]. Granstrom G, Bergström K, Odersjo M, Tjellstrom A. Osseointegrated implants in children: experience from our first 100 patients. Otolaryngol Head Neck Surg. 2001 Jul. 125(1):85-92. [Medline]. Hultcrantz M. Outcome of the bone-anchored hearing aid procedure without skin thinning: a prospective clinical trial. Otol Neurotol. 2011 Sep. 32(7):1134-9. [Medline]. Dun CA, Faber HT, de Wolf MJ, Mylanus EA, Cremers CW, Hol MK. Assessment of more than 1,000 implanted percutaneous bone conduction devices: skin reactions and implant survival. Otol Neurotol. 2012 Feb. 33(2):192-8. [Medline]. van de Berg R, Stokroos RJ, Hof JR, Chenault MN. Bone-anchored hearing aid: a comparison of surgical techniques. Otol Neurotol. 2010 Jan. 31(1):129-35. [Medline]. Cass SP, Mudd PA. Bone-anchored hearing devices: Indications, outcomes, and the linear surgical technique. Oper Tech Otolaryngol--Head Neck Surg. 2010. 21(3):197-206. D'Eredità R, Caroncini M, Saetti R. The new baha implant: a prospective osseointegration study. Otolaryngol Head Neck Surg. 2012 Jun. 146(6):979-83. [Medline]. Dun CA, de Wolf MJ, Hol MK, et al. Stability, survival, and tolerability of a novel baha implant system: six-month data from a multicenter clinical investigation. Otol Neurotol. 2011 Aug. 32(6):1001-7. [Medline]. Shirazi MA, Marzo SJ, Leonetti JP. Perioperative complications with the bone-anchored hearing aid. Otolaryngol Head Neck Surg. 2006 Feb. 134(2):236-9. [Medline]. Tjellstrom A, Granstrom G. Long-term follow-up with the bone-anchored hearing aid: a review of the first 100 patients between 1977 and 1985. Ear Nose Throat J. 1994 Feb. 73(2):112-4. [Medline]. Holgers KM, Tjellström A, Bjursten LM, Erlandsson BE. Soft tissue reactions around percutaneous implants: a clinical study of soft tissue conditions around skin-penetrating titanium implants for bone-anchored hearing aids. Am J Otol. 1988 Jan. 9(1):56-9. [Medline]. Wazen JJ, Young DL, Farrugia MC, et al. Successes and complications of the Baha system. Otol Neurotol. 2008 Dec. 29(8):1115-9. [Medline]. Liepert DR, DiToppa JC. The Nobelpharma auditory system bone-anchored hearing aid: the Edmonton experience. J Otolaryngol. 1994 Dec. 23(6):411-8. [Medline]. Wazen JJ, Caruso M, Tjellstrom A. Long-term results with the titanium bone-anchored hearing aid: the U.S. experience. Am J Otol. 1998 Nov. 19(6):737-41. [Medline]. Badran K, Bunstone D, Arya AK, Suryanarayanan R, Mackinnon N. Patient satisfaction with the bone-anchored hearing aid: a 14-year experience. Otol Neurotol. 2006 Aug. 27(5):659-66. [Medline]. Niparko JK, Cox KM, Lustig LR. Comparison of the bone anchored hearing aid implantable hearing device with contralateral routing of offside signal amplification in the rehabilitation of unilateral deafness. Otol Neurotol. 2003 Jan. 24(1):73-8. [Medline]. Wazen JJ, Spitzer JB, Ghossaini SN, et al. Transcranial contralateral cochlear stimulation in unilateral deafness. Otolaryngol Head Neck Surg. 2003 Sep. 129(3):248-54. [Medline]. Stenfelt S, Hakansson B, Tjellstrom A. Vibration characteristics of bone conducted sound in vitro. J Acoust Soc Am. 2000 Jan. 107(1):422-31. [Medline]. Bone-anchored hearing systems. Bone-conduction pathway for ipsilateral conductive hearing loss. Bone-anchored hearing systems. Bone-conduction pathway for contralateral single-sided deafness. Bone-anchored hearing systems. Template for determining site of implanted fixture-abutment. Bone-anchored hearing systems. Linear incision with separate site for fixture-abutment. Bone-anchored hearing systems. Skin flaps created. Bone-anchored hearing systems. Subcutaneous soft tissue removal. Bone-anchored hearing systems. Periosteum removed at implant site. Bone-anchored hearing systems. Guide drills: 3 mm then 4 mm depth. Bone-anchored hearing systems. Hole widened with drill countersink. Bone-anchored hearing systems. Fixture implanted using torque-limiting drill. Bone-anchored hearing systems. Closure and exteriorization of abutment through separate skin punch. Bone-anchored hearing systems. Dressing with healing cap. Bone-anchored hearing systems. Surgical site postoperative day 7. Disclosure: Received consulting fee from Cochlear Americas for consulting.